Two cabinet makers from Somerset who set out to install kitchens locally are about to revolutionise the industry with a potential £50 million turnover global business . . . while one battles a crippling illness. The story is made all the more remarkable as the inspiration for the success came in Paul Huggins’ darkest hour as he recovered in hospital from the shock of waking up to discover he couldn’t walk. Paul and friend Steve Bray’s fledgling business Woodwise was getting off the ground. The company had moved into an “empty shell” at Mendip Industrial Estate near Axbridge before winning a major contract with Somerset County Council to manufacture and install furniture. “Then I woke up one morning and I had lost the use of my legs,” says Paul remembering the exact day and date. Paul prefers not to dwell on the devastating impact of the disease on his and the lives of his family, but the first sign that the former RAF carpenter was ready to fight back came as he recovered in hospital. After “dragging his legs” to the washroom with the help of a zimmer frame, an innocent question changed the course of his business. “I said to the nurse ‘where do I put my clothes’. And she said, ‘Paul, you being a carpenter, know wooden furniture rots in places like this’. “Shortly after that there were lots of floods up in Hereford and Worcester, my father lives up there, and on the TV news there were pictures of skip after skip after skip full of kitchens. A spell of extensive research followed and the pair soon discovered no one was manufacturing a waterproof cabinet material. Together the two Somerset cabinet makers and the German plastics giant spent a year developing Sealwise and in return Paul and Steve were given exclusive rights to market and sell the product worldwide, but no finance. Despite coming up with something which was waterproof, fire retardant, virtually unbreakable, manufactured with an anti-bacterial material making it perfect for use in the medical sector and could be fully recycled, the launch of the product onto the market was only made possible after Paul and Steve turned to Clifton Asset Management following rejection from the banks. “We wouldn’t have survived without the help from Clifton,” Paul admitted. Guidance from the pensionledfunding.com team helped generate capital for the business and a better personal pension deal long term. The IP was independently valued and the business partners used £45,000 from their joint pension pots to fund research and to keep the business running. But just as their business recovery was gaining pace they were hit by a second blow, this time in the form of a difficult period with new funding partners. After regaining full control of the business, new contracts followed and Paul and Steve were introduced to the head of one of Ireland’s biggest wood importer’s Tradewood. 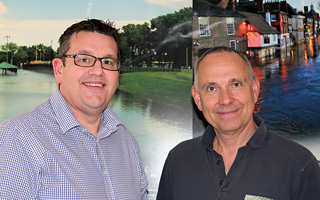 David Good, with more than 30 years’ experience in the industry, started out as a Sealwise customer before becoming a partner with a 50 per cent stake, helping to finance expansion as the company was relaunched as Sealwise 2014. Another five smaller shareholders, including friends Paul Waite and Carl Turner from accountants Aspen Waite, were recruited as the potential of Sealwise products became recognised with customers including Harley Street dentists as well as schools, hospitals, prisons and even the military. Their client list includes Wells Cathedral School, Battersea Dogs Home and Sealwise 2014 has now broken into markets in Canada, Spain, Italy, Kuwait, Dubai and Saudi Arabia. The Kuwaiti Government is about to spend billions of pounds on new hospitals and Sealwise 2014 is in prime position to be chosen to supply bespoke cabinets and workplace furniture. As the business has grown so has the potential of their product, says Paul, running off a list of uses which includes shuttering as they eye a deal with Transport for London. “We just found out Sealwise is one of the best materials to print on in the world. We didn’t know about it,” he says with a smile. Looking ahead he said: “We believe Woodwise has the capability of being a £20 million to £30 million turnover per annum company. Not bad for two guys who were only planning to install a few kitchens. Paul Huggins and Steve Bray started Woodwise, a kitchen and installation business, back in 2006 but after Paul became ill, a moment of inspiration while he recovered in hospital set them on the path to becoming potential world market leaders in the cabinet industry and beyond with an exciting new product. Paul and Steve turned to Clifton Asset Management following rejection from the banks despite launching a new product called Sealwise which was waterproof, fire retardant, virtually unbreakable, ideal for the medical sector and could be fully recycled. The new company’s IP was independently valued and the business partners used £45,000 from their joint pension pots to fund research and to keep the business running during its formative years. The two friends and a German plastics giant spent a year developing Sealwise and in return Paul and Steve were given exclusive rights to market and sell the product worldwide. The company was relaunched as Sealwise 2014 in a new partnership with David Good from Tradewood and last year turnover started to gain pace. Their client list includes Wells Cathedral School and Battersea Dogs Home and Sealwise 2014 has now broken into markets in Canada, Spain, Italy, Kuwait, Dubai and Saudi Arabia. The Kuwaiti Government is about to spend billions of pounds on new hospitals and Sealwise 2014 is in prime position to be chosen to supply bespoke cabinets and workplace furniture. The product potential is still growing and includes the printing industry and shuttering, with a deal with Transport for London in their sights. “We believe Woodwise has the capability of being a £20 million to £30 million turnover per annum company. Sealwise on its own, not being too ambitious, we think we can get that up to £40 million or £50 million turnover per annum,” said Paul.